BlockSwap Ltd is a genuine way to access the global business markets of tomorrow. We are an expert group of dedicated developers, traders, and analysts who believe in the upcoming model shift that crypto-currency and the Blockchain are bringing dividend to the global monetary industry. In our profession, we use only superior technologies and advanced algorithms for trading process and marketing promotion of the company. Digital currencies are one of the most interesting markets for traders today. They are highly volatile, fast-paced markets, in which a lot of money can be made in a short period of time. Our organization trade with Bitcoin, Litecoin, Ethereum, Dash, Monero, Zcash, Ripple and many more. For Example, we use Poloniex, BitStamp, BTCe, Bittrex and many other trading platforms for trading this cryptocurrencies. To assure safe and comfortable access to the worldwide financier's markets for our clients, our servers are physically located in the heart of the financial industry in the HK. BlockSwap Ltd is a certified Private company limited in HK. The development of the exchange never stopped, and we approved some important partnerships in order to enhance the features granted to our clients. 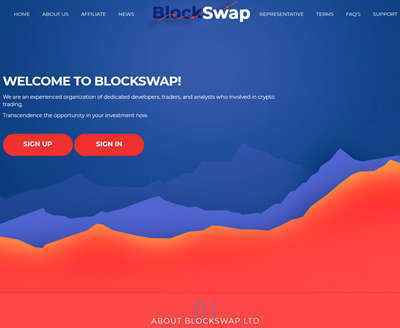 BlockSwap Ltd offers the best positions in the international market of investment and trust management. The technical group and the team of financial experts are making every effort to ensure the safety of your assets and rapid addition of your capital. 21.02.19 14:11 Transfer Sent Payment: 200.00 USD to account U19961421 from U1294xxx. Batch: 247408611. Memo: Shopping Cart Payment. Deposit to www.blockswap.biz User all-hyips.info. Memo : Shopping Cart Payment. Deposit to blockswap.biz . 22.02.19 06:42;Account;Receive;Received Payment 1.5 USD from account U19961421 to account U1294000. Batch: 247489779. Memo: API Payment. Withdraw to all-hyips.info from www.blockswap.biz. 22.02.19 03:22;Account;Receive;Received Payment 6.5 USD from account U19961421 to account U1294000. Batch: 247476114. Memo: API Payment. Withdraw to all-hyips.info from www.blockswap.biz. Memo : API Payment. Withdraw from blockswap.biz. 22.02.19 17:27;Account;Receive;Received Payment 5.5 USD from account U19961421 to account U1294000. Batch: 247571278. Memo: API Payment. Withdraw to all-hyips.info from www.blockswap.biz. 24.02.19 18:26;Account;Receive;Received Payment 7.00 USD from account U19961421 to account U1294000. Batch: 247815187. Memo: API Payment. Withdraw to all-hyips.info from www.blockswap.biz. 25.02.19 04:56;Account;Receive;Received Payment 5.00 USD from account U19961421 to account U1294000. Batch: 247852493. Memo: API Payment. Withdraw to all-hyips.info from www.blockswap.biz.